For homeowners who might be considering a kitchen redesign or renovation, space saving solutions are always a factor. For smaller or older homes, space is a valuable commodity. 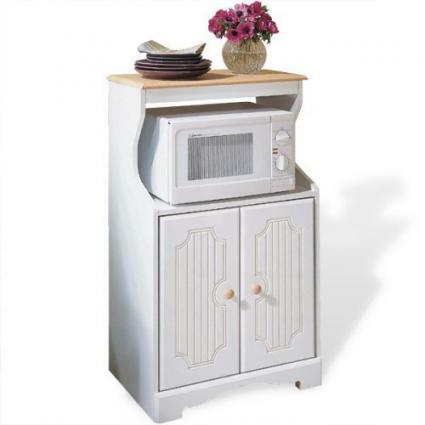 One very unique piece of furniture that many homeowners have found to be helpful is a space saving microwave cart. These units are a very cost effective way to save space, and offer a method to organize anything microwave related into one compact area. The concept behind the microwave cart is certainly straight forward. The cart is a compact and portable unit with a foot print that accepts the average sized consumer microwave oven. They're typically counter height, but may vary depending on the manufacturer. Most designs are outfitted with at least one drawer for utensils, and a lower shelf space for larger kitchen accessories or supplies. The four wheels make moving the cart very convenient, and can generally be locked in order to secure the cart once it's in the desired location. The design and materials used to fabricate these microwave carts will vary, but there is certainly a cart for every kitchen style and taste. The materials for a microwave kitchen cart used may range from wood to metal, and in each case they are certain to be choices in regards to wood species or type of metal used. Composite materials may even be used. The configuration of a space saving microwave cart will depend on a family's needs. For smaller kitchens, a cart with more storage would be appropriate, while larger kitchens might employ a more simple cart design. Carts could be as basic as a rolling table that accommodates only the microwave, or they may be enclosed units with several drawers and other convenient storage options. The portability of microwave carts also acts as a space saving feature. Rather than have more that one area to prepare or heat food, a cart can be conveniently moved from the kitchen to the dining area. It may even be moved outside onto a deck or patio for outdoor entertaining. In general these carts are designed to travel easily through hallways, and interior or exterior doors alike. Whether it's bought in kit form, or it's ready to roll, the space saving microwave cart offers a wonderful solution for homes or apartments that are short on space. Homeowners may even find themselves buying additional carts to act as added workspace in kitchens to small for expensive counters.